When I woke up this morning the rain was slashing against the windows, the tires were swishing past in the puddles, and you were on my mind. You see, I haven't been able to be with you as much for the last week and I worry that you will think I am neglecting our friendship. Of course I would never do that, but sometimes life gets in the way of blogging, and visiting, and just keeping up. The independent living apartments, where my mom has been living for the past two years, were just not working out. Too expensive, too many internal problems, and no real security system in place. So last year we put her on the waiting list for a different apartment and her name finally came up. Yesterday we signed the lease and she took possession of what will be her new home. That means I am busy helping her with her move and it means a few other things are having to slide. By the end of next week I hope to have her all settled in with the pictures hung on the walls, and I will be able to get back to my normal routine. In the meantime, please know that you are on my mind. Oh, and that is my new antique iron bed I bought this winter. 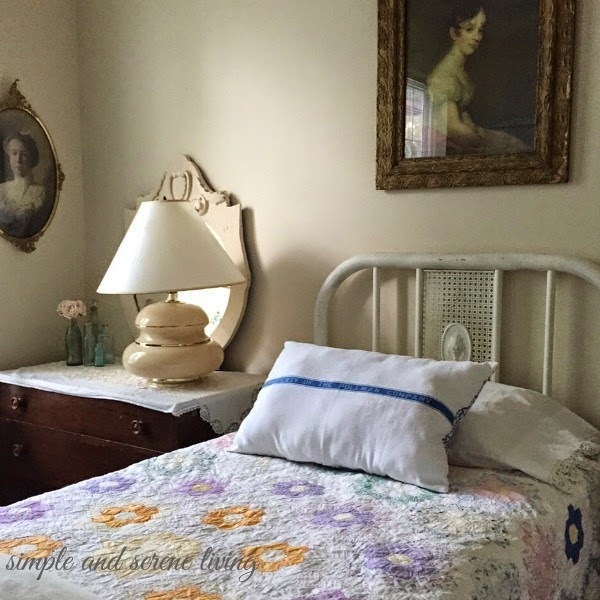 I've been meaning to show it to you, and here it is now in a post that has nothing to do with finding the perfect iron bed. That's just how things happen sometimes. P.S. Make sure you check back here on Monday. I will be here and and you will get to see what I did recently with a group of other women bloggers. I haven't seen it yet and I am a bit nervous about it. oh, so good to hear your mom will have a more suitable place! Me gustan los muebles de época,,,un saludo desde Murcia. I hope your mother likes her new home. Take care! Oh, you must be so busy moving your mum from apartment. I love that picture of your bedroom. Take some time to rest. Oh, I'm sure you are so relieved to have her moving to a new place! I just moved my mom recently into senior living apartment that is more affordable and more secure. She loves it and has made a lot of new friends. Good luck with helping your mom into her new place. Thinking of you as you help your mom! Love your iron bed. I love your new iron bed! It's so old fashioned (my fave). Your bedroom looks very cozy. I hope your mom is happy with her new home. I'm so glad that your Mom will be in a more secure place, at any age it's important, but when we are older it's imperative. The move is I'm sure exhausting for both of you, and you are doing a great job of balancing it all. Can't wait to see what you have up your sleeve!!! I can certainly relate to life getting in the way.....I have a very similar quilt on my bed and like yours it is probably hand stitched. Lovely! Your new be and your bedroom are beautiful!